Contact glue is known for its high strength and fast bonding ability. This makes it an ideal glue for bonding things like furniture, construction material, flooring and concrete. It can become a problem, though, if it accidentally spills onto an unintended object or surface. 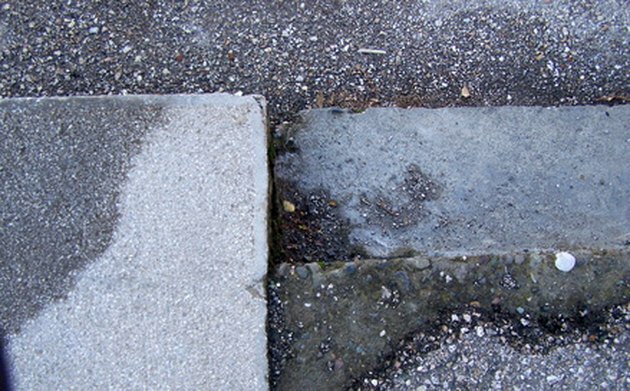 It's important to act quickly to remove concrete glue, because the longer it sits the harder it will be to remove. Remove concrete glue with a few simple techniques. Clean up as much glue as possible while it's still wet with a paper towel or cloth. If the glue has a chance to dry, it will be much harder to remove. Soften the contact glue with heat if you have two items stuck together. Set a hair dryer on low heat about 6 inches from the items that are stuck until you are able to pry them apart. Wet a cotton ball with acetone fingernail polish remover. Acetone is known for removing tough glue stains. Dab the cotton ball on the contact glue until it dissolves. Wipe the glue clean with a clean cloth. Break up the contact glue with another solvent if the acetone doesn't work. Dampen a cloth with rubber cement thinner and then rub it on the glue. Let it sit for several hours. This will help break up the adhesive. Remove the glue with a clean, dry cloth. Use a chemical product for stubborn contact glue. Dab a small amount of lighter fluid (any kind will do) on a cloth and rub it on the glue. This should easily remove the glue. Make sure you are in a well-ventilated area while using chemicals. Buy a commercial adhesive removal product. These products contain more than one solvent and are very successful in removing glue. You can find them in the home improvement aisle of grocery and hardware stores.